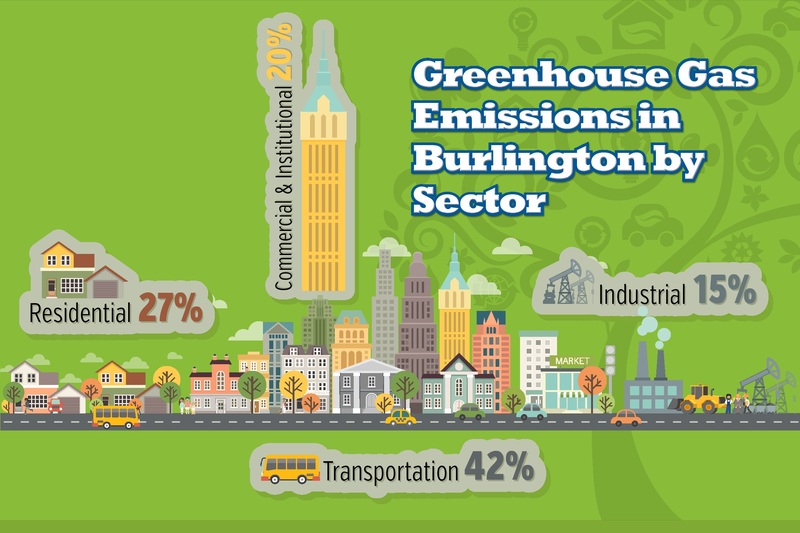 GHG emissions in Burlington by sector. When it comes to global issues such as climate change, do you feel overwhelmed and wonder whether one person can really have an impact? What if each and every one of us does just one thing to reduce greenhouse gas emissions? Collectively, we will make a difference. And, maybe that one small thing you do will inspire someone else to do one thing to help the environment. 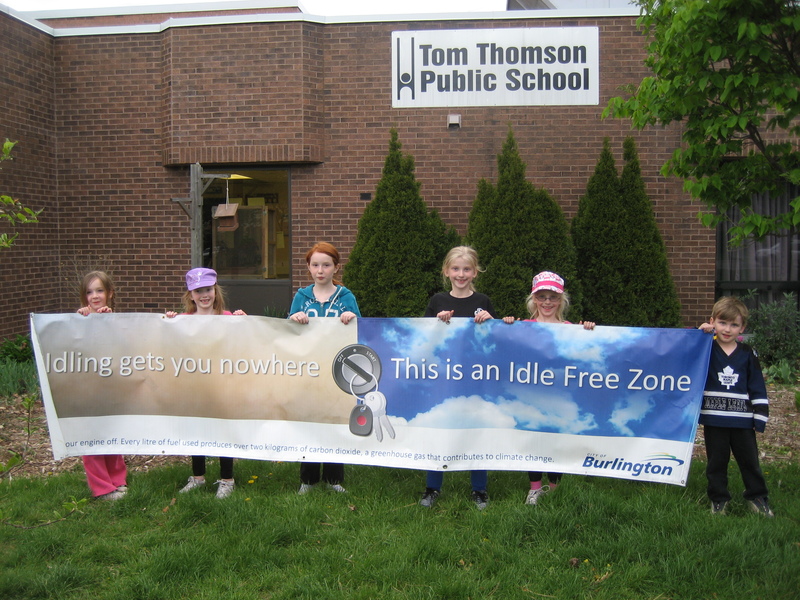 There are so many reasons why unnecessary idling is not a great idea: it releases emissions that contribute to climate change; it is not good for your vehicle; and in many communities, including Burlington, it is against the law. Remember, idling gets you nowhere and it might result in a $120 fine! Save your money and the environment just by turning your engine off. Are you trying to reach 10,000 steps a day? Walk or cycle instead of driving. You’ll reach your steps goals faster and reduce emissions by not driving your gas/diesel car. For longer trips, try transit or carpooling. In Burlington, we love our cars and it’s affecting the environment. Our transportation sector represents about 40 per cent of our community greenhouse gas emissions. Choosing to get out of our single occupied vehicle and use an alternate option will help to reduce Burlington’s emissions. St Raphael Catholic School students celebrate Bike to School Week 2016. Time for a new car? Check out an Electric Vehicle (EV)! Visit Plug ‘N Drive’s website for information about EVs and check out the EV Discovery Centre in Toronto for a sales-free, no-pressure test drive of various makes and models. If you choose an EV, you can receive a rebate of up to $14,000 through the Electric Vehicle Incentive Program to help cover your upfront costs. Once you have one, EVs require almost no maintenance and you can “refuel” at home. It does take a while to charge your EV at home using a standard 110 volt outlet (Level 1), so some people are installing Level 2 charging stations (220 volt) at home. If you do install one, you can receive up to $1,000 through the Electric Vehicle Charging Incentive Program. EVs are getting more popular and there are more public charging stations (Level 2 and 3) being installed. 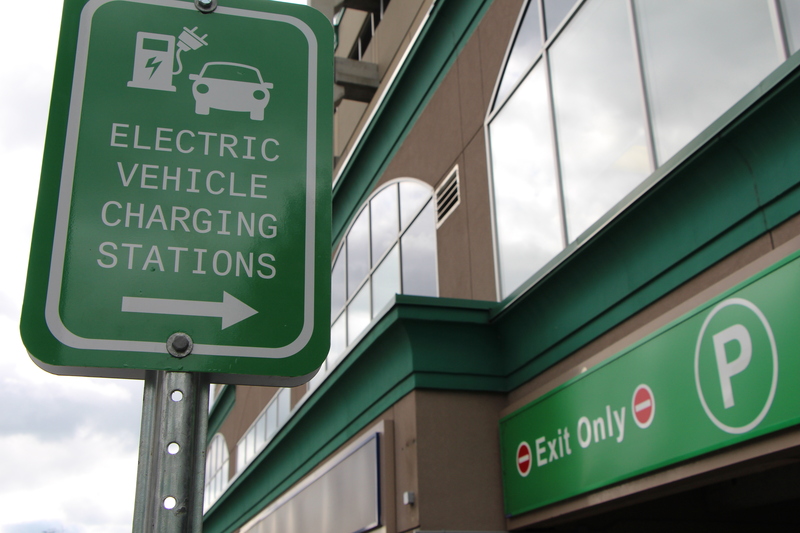 Visit PlugShare or ChargeHub for a full list of public charging stations in Canada. Did you know that what and how much we buy has a huge impact on the environment? Do I really need that item? Can I borrow it from a friend? Can I purchase it second hand or rent it? If you decide you need to buy something, ask questions to find out how the item was made and if there are more sustainable choices. Is the product made locally or shipped from far away generating more greenhouse gas emissions? How will the item be disposed? Can it be recycled, reused or composted to keep it out of the landfill? Concept and creative courtesy of Metro Vancouver. Smart thermostats learn your schedule and preferences for energy savings. You can also control your thermostat from anywhere around the world through your phone, tablet, laptop or desktop computer. If you don’t have a smart thermostat, but have a programmable thermostat at home, ensure you use the programming feature to adjust the temperature settings when you are not home to reduce emissions and save money. Considering a home renovation? Updated bathrooms and kitchens are considered desirable by many but ensure you get the most “bang for your buck” by considering ways to increase energy efficiency. 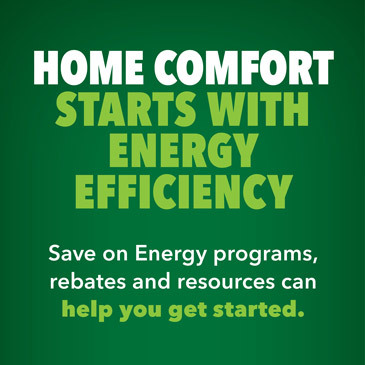 Contact GreenOn Support at 1-888-728-8444 for free advice from impartial home energy experts. Do some rooms in your home feel too hot, too cold or just right? If you’re too hot or too cold, maybe you need more insulation or new windows. Right now, there are rebates of up to $7,200 to purchase and install insulation and up to $5,000 for select high-performance windows installed by an approved contractor. Do you need a new furnace or air conditioner? Save $250 for a high efficiency furnace or $600 for an Energy Star certified central air conditioner through Save On Energy. Switch to an air source heat pump, which uses outside air to heat and cool your home more efficiently while reducing your carbon footprint, and receive up to $5,800 if using an approved contractor. Additional information about heat pumps is available through BurlingtonGreen’s Make the Switch campaign. Love that fresh air scent? Get it naturally by air drying your laundry. You’ll also save energy and wear and tear on your clothes. 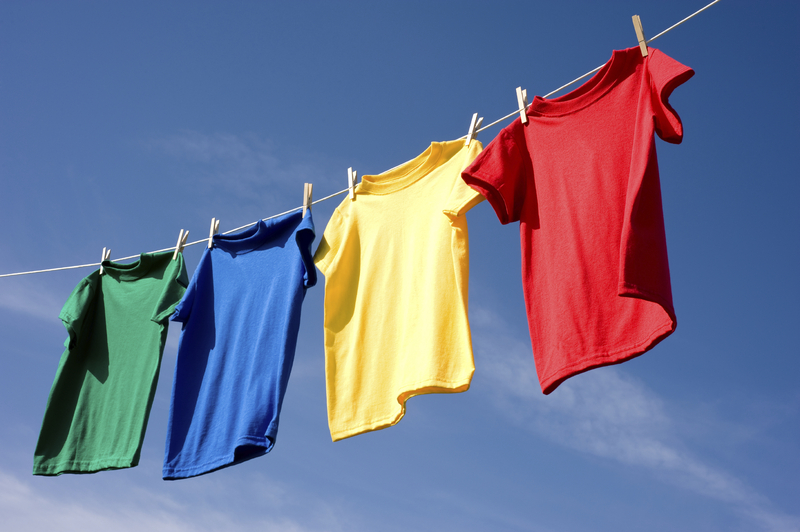 Visit Save On Energy’s website for coupon events to help you save money on clotheslines and other energy efficient products. Hanging laundry outdoors on a clothesline. Stay tuned for tips 10 to 18 later this month. How will you show you care for our planet this year? Tell us using #TakeActionBurlington or #LiveGreenBurl. Let’s all do our part to reduce our impact on the environment. Take Action Burlington! Collectively, we can make a difference. Enter your email address to follow the Take Action Burlington blog and receive notifications of new posts by email.